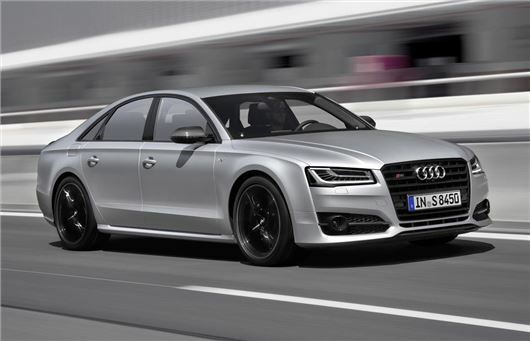 Audi has launched an even more powerful version of the S8 performance saloon. The S8 plus has power boosted from the 520PS of the standard car to 605PS giving it a 0-62mph time of just 3.8 seconds. It costs an eye-watering £97,700 and will arrive here in early 2016. Powered by a 4.0 TFSI V8 engine, the S8 plus has 750Nm of torque - the highest output of any Audi in the model range. To deal with the extra power, it also gets carbon-fibre reinforced ceramic brakes and a sports differential. As you'd expect given the price, the S8 plus comes with adaptive air suspension and dynamic steering along with 21-inch alloys with specially designed 275/35 tyres. To make the S8 plus distinctive from the standard S8, it gets darkened tail lights and a rear lip spoiler. The mirror caps and rear spoiler can also be specified in carbon fibre. A matt-effect paint finish in silver is exclusively available. Inside, the S plus gets sports comfort seats in leather with red stitching while extras include privacy glass, power closing doors and adaptive cruise control with Audi pre-sense front.